and a 1000 litre HFA concentrate tank. The entire system is controlled by a state-of-the-art PLC. For over 20 years HYDROWATT has supplied high-pressure pumps to the mining industry, building continuously on experience gained in the French, German and British coal mines. Many of these improvements result from the close relationships developed with mining engineers working underground with HYDROWATT pump systems over the years. The efficiency of an underground coal mine depends very much on the continuous availability of the high pressure hydraulics. The high reliability of high-quality components such as the HYDROWATT, along with its fast and simple maintenance when required have allowed mine operators to maximise their production. 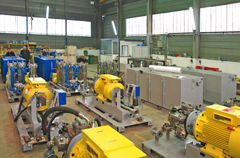 HYDROWATT high pressure pump systems combine safety and quality with top class technology.